Lonely Planet British Columbia & the Canadian Rockies is your passport to all the most relevant and up-to-date advice on what to see, what to skip, and what hidden discoveries await you. Watch wildlife in Jasper National Park, stroll the seawall at Vancouver's Stanley Park, and set sail on a ferry service through the Inside Passage; all with your trusted travel companion. Get to the heart of British Columbia & the Canadian Rockies and begin your journey now! The Perfect Choice: Lonely Planet British Columbia & the Canadian Rockies, our most comprehensive guide to British Columbia & the Canadian Rockies, is perfect for those planning to both explore the top sights and take the road less traveled. •	Looking for a guide focused on the highlights of Vancouver? Check out Lonely Planet's Vancouver guide for a comprehensive look at what Vancouver has to offer. •	Looking for more extensive coverage? Check out Lonely Planet's Canada guide for a comprehensive look at all the country has to offer or Discover Canada, a photo-rich guide focused on the country's most popular sights. 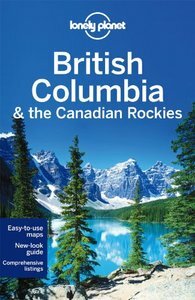 Authors: Written and researched by Lonely Planet, John Lee, Brendan Sainsbury, and Ryan Ver Berkmoes.